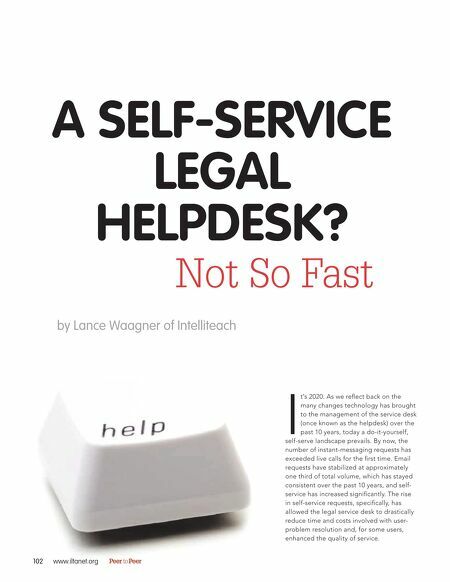 A SELF-SERVICE LEGAL HELPDESK? Not So Fast by Lance Waagner of Intelliteach I 102 www.iltanet.org Peer to Peer t’s 2020. As we reflect back on the many changes technology has brought to the management of the service desk (once known as the helpdesk) over the past 10 years, today a do-it-yourself, self-serve landscape prevails. By now, the number of instant-messaging requests has exceeded live calls for the first time. Email requests have stabilized at approximately one third of total volume, which has stayed consistent over the past 10 years, and self- service has increased significantly. 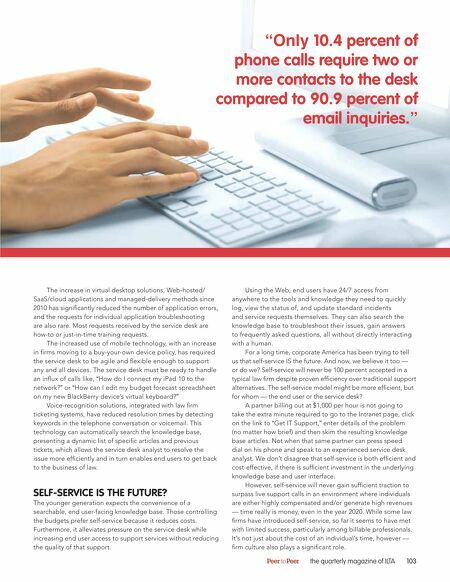 The rise in self-service requests, specifically, has allowed the legal service desk to drastically reduce time and costs involved with user- problem resolution and, for some users, enhanced the quality of service.